On December 21, 2014, Beji Caid Essebsi, leader of Nidaa Tounes party, won the first free presidential elections in the Tunisia history, beating in the second round with the 55.68% of the votes the candidate Moncef Marzouki, who was stopped at the 44, 32%. In the first round of the November 23, 2014 the two candidates had obtained respectively the 39.46% and the 33.43% of the votes. Voters chose the first country's president after the expulsion of Zine el-Abidine Ben Ali in 2011, through presidential elections with direct suffrage. In 2011, however, immediately after the revolution, the old president Moncef Marzouki was elected by the Constituent Assembly with indirect suffrage. 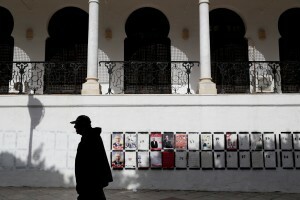 A man looks at the election posters on a wall in Tunis on November 13, 2014. 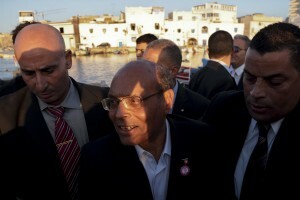 Moncef Marzouki, leader of the centre-left secular political party CPR (Congress for the Republic) during a campaign meeting in Bizerte, north-east of Tunis on November 19, 2014. 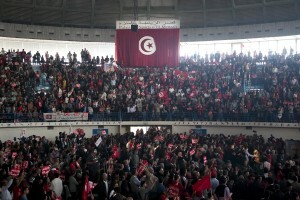 Supporters of the leader of Popular Front, spokesman of the Tunisian Workers’ Party and presidential candidate Hamma Hammami during a meeting held at Sports palace in the Olympic city of El Menzah in Tunis on November 16, 2014. 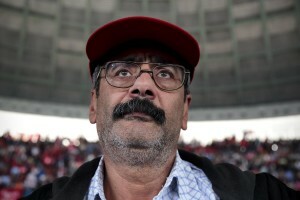 A supporter of the leader of Popular Front, spokesman of the Tunisian Workers’ Party and presidential candidate Hamma Hammami during a meeting held at Sports palace in the Olympic city of El Menzah in Tunis on November 16, 2014. People walking inside the sports palace in the Olympic city of El Menzah before a campaign meeting of Beji Caid Essebsi, Tunisian leader of the main anti-Islamist party Nidaa Tounes and presidential candidate in Tunis on November 15, 2014. A man smokes a cigarette inside the sports palace in the Olympic city of El Menzah after the campaign meeting of Beji Caid Essebsi, Tunisian leader of the main anti-Islamist party Nidaa Tounes and presidential candidate in Tunis on November 15, 2014. 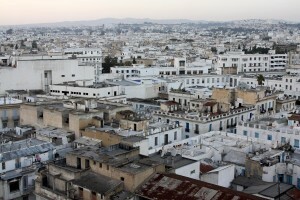 A general view of Tunis on October 19, 2012. Supporters of Moncef Marzouki, leader of the centre-left secular political party CPR (Congress for the Republic) during a campaign meeting in Bizerte, north-east of Tunis on November 19, 2014. 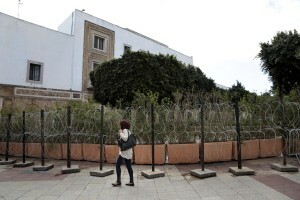 A woman walks near the tunisian Ministry of finance in Tunis on November 13, 2014. Staff of Tunisian presidential candidate and leader of the Free Patriotic Union (UPL) party, Slim Riahi, at work during the campaign rally held in Avenue Bourguiba in Tunis on November 21, 2014. The Free Patriotic Union came third in last month’s parliamentary election with 16 seats. 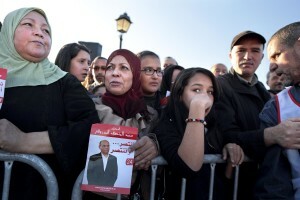 People during the campaign rally of Tunisian presidential candidate and leader of the Free Patriotic Union (UPL) party, Slim Riahi held in Avenue Bourguiba in Tunis on November 21, 2014. The Free Patriotic Union came third in last month’s parliamentary election with 16 seats. 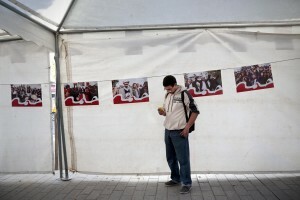 A supporter of Leader of the Popular Front, spokesman of the Tunisian Workers’ Party and presidential candidate Hamma Hammami stands in Avenue Bourguiba in Tunis on November 15, 2014. 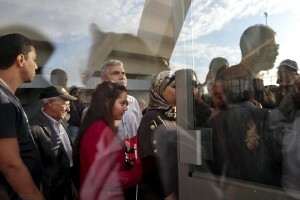 People access into the sports palace in the Olympic city of El Menzah before a campaign meeting of Beji Caid Essebsi, Tunisian leader of the main anti-Islamist party Nidaa Tounes and presidential candidate in Tunis on November 15, 2014. A boy rests inside the sports palace in the Olympic city of El Menzah after the campaign meeting of Beji Caid Essebsi, Tunisian leader of the main anti-Islamist party Nidaa Tounes and presidential candidate in Tunis on November 15, 2014. Supporters of Tunisian presidential candidate and leader of the Free Patriotic Union (UPL) party, Slim Riahi, attend a campaign rally in Avenue Bourguiba in Tunis on November 21, 2014. The Free Patriotic Union came third in last month’s parliamentary election with 16 seats. 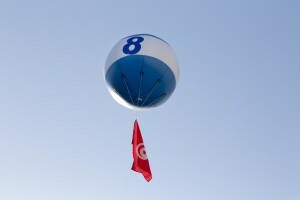 A big ballon supporting the Tunisian presidential candidate and leader of the Free Patriotic Union (UPL) party, Slim Riahi, flys in the sky during a campaign rally in the capital of Tunis on November 21, 2014. The Free Patriotic Union came third in last month’s parliamentary election with 16 seats. 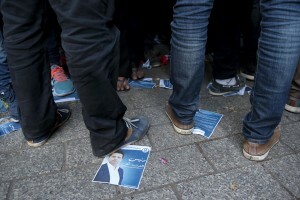 A man walks near election posters attached on the wall of tunisian ministry of finance in Tunis on November 13, 2014. Tunisians journalists and staff of Moncef Marzouki, leader of the centre-left secular political party CPR (Congress for the Republic) during a campaign meeting in Bizerte, north-east of Tunis on November 19, 2014. A boy is portrayed near a wall intended to accommodate election posters in Tunis on November 19, 2014. 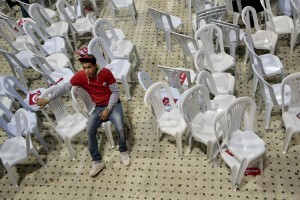 Supporters of the leader of Popular Front, spokesman of the Tunisian Workers’ Party and presidential candidate Hamma Hammami before a meeting held at Sports palace in the Olympic city of El Menzah in Tunis on November 16, 2014. 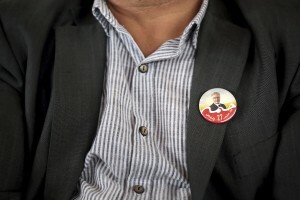 A man with a brooch of the leader of Popular Front, spokesman of the Tunisian Workers’ Party and presidential candidate Hamma Hammami during a meeting held at Sports palace in the Olympic city of El Menzah in Tunis on November 16, 2014. Leader of the Popular Front, spokesman of the Tunisian Workers’ Party and presidential candidate Hamma Hammami speaks during a meeting held at Sports palace in the Olympic city of El Menzah in Tunis on November 16, 2014. 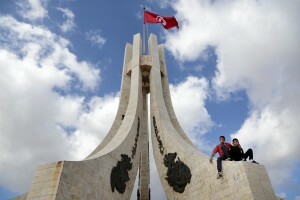 Two children sitting on the memorial to Tunisians martyrs in place de la Kasbah in Tunis on November 13, 2014. 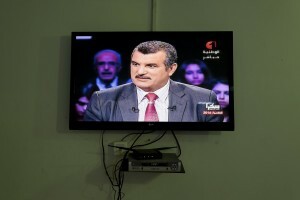 A television shows the presidential candidate Mohamed Hachemi Hamdi during a political TV program in Tunis on November 19, 2014. 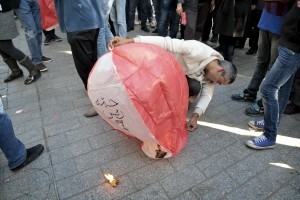 Supporters of Leader of the Popular Front, spokesman of the Tunisian Workers’ Party and presidential candidate Hamma Hammami try to fly a ballon in Avenue Bourguiba in Tunis on November 15, 2014. 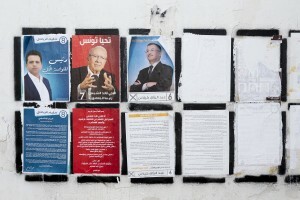 Election posters on a wall in Tunis on November 13, 2014. 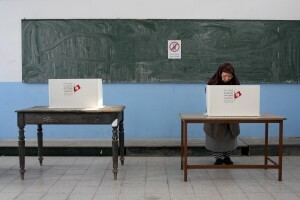 A Tunisian man prepares to casts his vote in the country’s first post-revolution presidential election in a school of Tunis turned in a polling station on November 23, 2014. A Tunisian woman prepares to casts her vote in the country’s first post-revolution presidential election in a school of Tunis turned in a polling station on November 23, 2014. 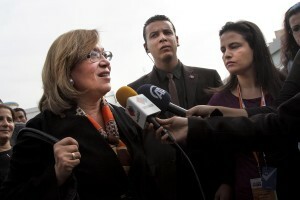 Former chairwomen of the judges association and presidential candidate, Kalthoum Kannou speaks with journalists after voting in the country’s first post-revolution presidential election at a polling station in Tunis on November 23, 2014. 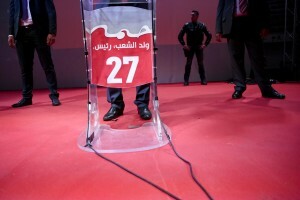 Beji Caid Essebsi, Tunisian leader of the main anti-Islamist party Nidaa Tounes and presidential candidate during a meeting held at Sports palace in the Olympic city of El Menzah in Tunis on November 15, 2014.